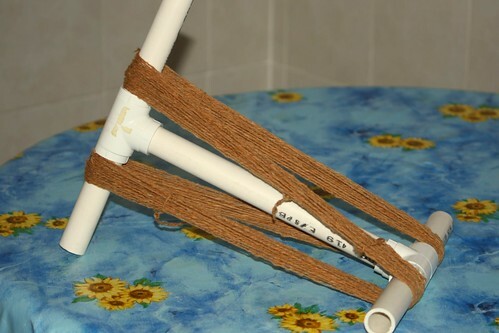 Although I do own a spinning wheel, I chose to spin my cotton by hand because there was such a small quantity and because at the moment I need portable projects. All but the first photo were taken at work. I spun during lulls at work. I grew this cotton myself in pots on a balcony. 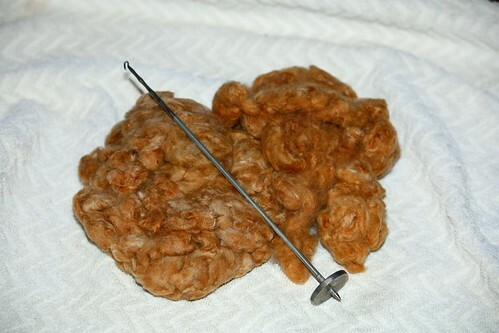 It’s brown naturally coloured cotton. The lint from two plants came to about 19 grams. 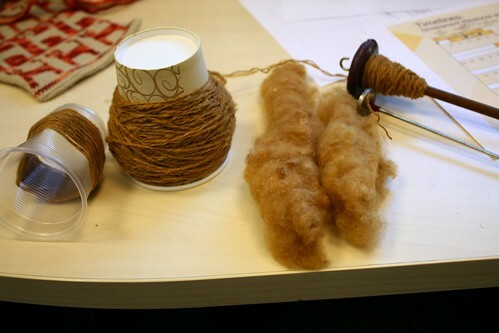 I tried several methods of preparing the cotton, including beating it with a forked stick, but in the end I carded it v-e-r-y gently with a pair of Ashford wool cards. The resulting mass could be considered a tight rolag or a loose puni. 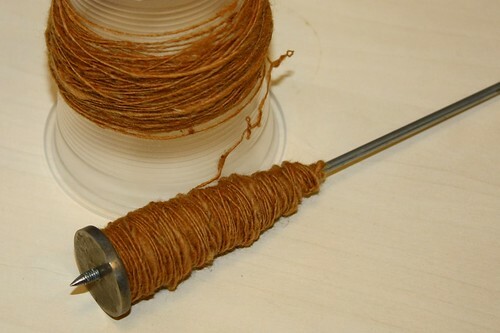 A tahkli is an Indian supported spindle. To be honest, I’m not sure whether it’s from India or American-made. I rest the pointed tip of the spindle on my desk (with a piece of paper underneath to provide some friction so that it doesn’t run around my desk) and spin the tahkli with a quick flick of my right hand. My left hand holds the cotton and drafts it so that the spin enters the drafting zone. When the tahkli gets full, I have to wind off the spun cotton. I didn’t have a nostepinne at work and — for a change — someone had actually changed the empty toilet paper rolls in the ladies’ room so I couldn’t harvest any cardboard tubes. I used a disposable plastic cup and wound the tahkli round and round to wind off the single ply of cotton. 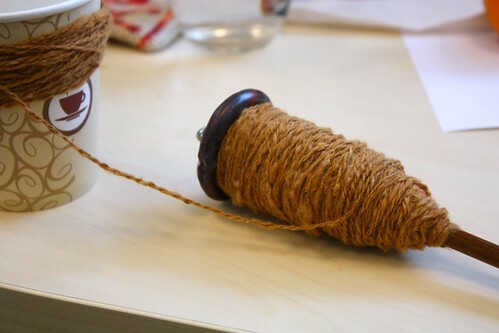 When I had wound the tahkli off four times onto two plastic cups, I started spinning on my plying spindle. It’s a top-whorl fimo spindle that someone made for me years ago. It’s become slightly unbalanced because it got chipped on the edge. Also, the central shaft is varnished, which makes it a bit slippery for rolling along the outside of my thigh to insert the twist. It will never be one of my favourite spindles but it’s more than adequate for plying. Plying with 2 cups holding the singles was NOT a lot of fun. They’re very light, so there was a lot of twisting back on itself. I had a couple breaks where the singles were too thin. 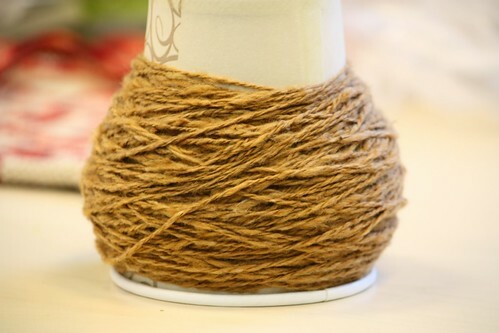 Also, when the plying spindle started to get full I had to break the yarn, wind off the plied cotton onto a paper cup, and start plying again with an empty spindle. Only two more rolags to go! The paper cup holds the yarn I’ve plied so far. The plastic cup on the left holds the single that was left over. The tahlkli is empty. When I’ve spun the remaining cotton, I’ll wind it off onto the other plastic cup and finish plying with the larger spindle. I’m not sure what I’ll do with the finished yarn. 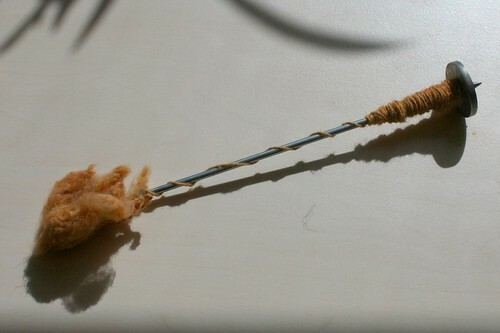 It’s a bit too fine to use in a Weavette, so perhaps I’ll crochet something small. Any suggestions? Did I mention that I have a bag of home-grown green cotton that I have to spin? 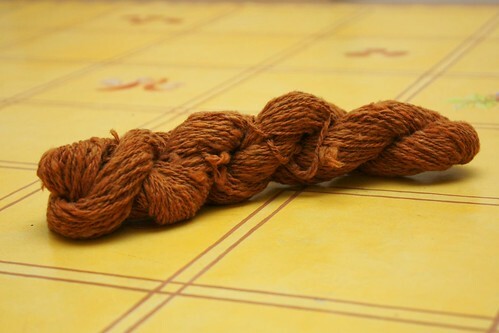 It’s about half the quantity of the brown, so it shouldn’t take very long but I think I’ll use a lazy kate for the plying.